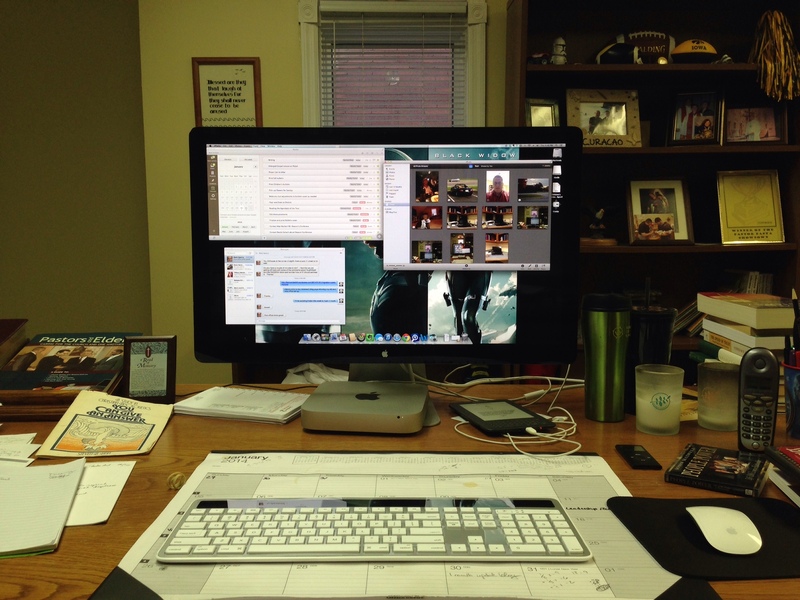 I’m about one month into the great Mac experiment at my office (see previous thoughts HERE). I thought I would take some time to share: The Good, The Bad, and The Dreamy (things that I’d still like to add). 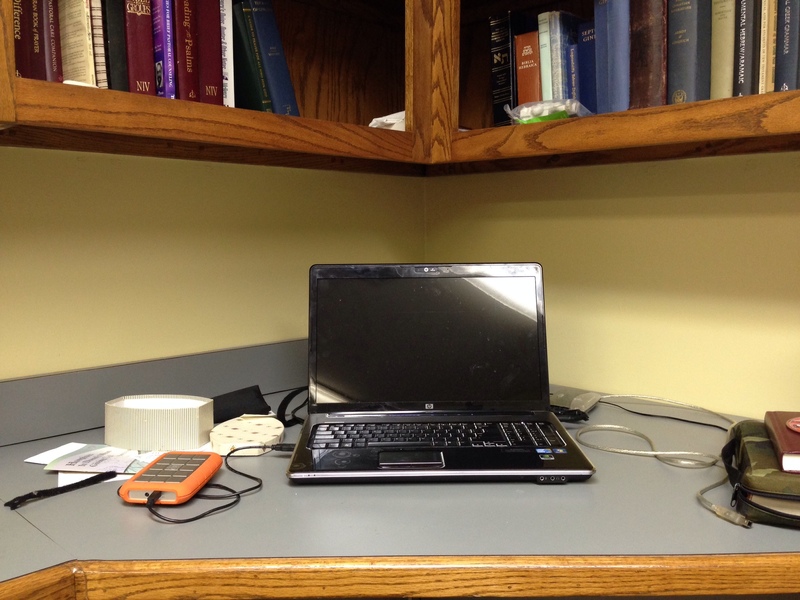 Here’s a picture of my fully realized workspace in my office at Ascension Lutheran Church. 1. iCloud: this feature has been a total lifesaver. It brought over my contacts, my preferences, even my bookmarks (which I’ll cover later). With some help from my brilliant wife, I was even able to bring over a lot of my archived e-mail messages from Outlook on my HP (although I still have yet to look at any of them.) And iCloud makes all my other Apple devices work in perfect harmony as well (except bookmarks… more teasers). 2. Dropbox: There is no reason NOT to use this free service/ app. It installs onto either Mac or “PC” and automatically syncs files across all devices. I even set up a shared folder on another Dell machine I use for publications as a quick and easy way to share files back and forth. I’ve almost reached my limit of free space but the ease of use and universality of sharing will make it money well spent. 3. Nozbe: I’ve played with Nozbe but the big limiter to me was that it was only on my iDevices and not on my desktop. On my HP it was only accessible through a web version and not very useful. (Web apps contribute too much to internet wandering for me so I tend to avoid them.) But in Mac-land, Nozbe is a desktop app and it is single-handedly helping me to get more stuff done as well as forget less stuff. The addition of Nozbe to my desktop workspace is starting pay off HUGE. MS Office 365 has made it so that Sara and I didn’t have to sink huge amounts of cash into the standard Office suite. The Apple App Center is a great one-stop shop for new programs and updates. And, as you can tell from the pic above, I have a huge 27″ Thunderbolt which not only gives a lot of great visuals but also adds 3 USB ports on the back. Beautiful and handy! BlueTooth peripherals (mouse and keyboard) also free up existing USB ports. 1. Bookmark Tribble Syndrome: Can’t remember how I did it exactly but I found a way for my Google Chrome bookmarks to sync with my iPad and iPhone. Handy for looking at Safari on the run. But, when I added the Mac Mini to the mix, my bookmarks ran wild like the fuzzy little creatures on the original Star Trek program. After trying to keep some more useful bookmarks, I finally just declared “bookmark bankruptcy,” deleted them all from all browsers and started over. I also signed out of Google Chrome at home. There are still some that are creeping around and I haven’t found where they’re coming from. It was a hassle in the middle but has since resolved itself. 2. MS Publisher is MIA: This isn’t a total “deal breaker” but it requires me to use my laptop or a less powerful desktop for some layout work that I do. I’m searching for an inexpensive substitute that will also import my old Pub files; I’m not at all interested in learning how to dual boot . But, my work in this genre is limited so I’m only using my laptop for maybe an hour a week to accomplish these tasks. 3. Lutheran Service Builder: This is a great program produced by my denomination, the LCMS, to help build orders of service (OoS). We print our OoS in the bulletin each week and this is invaluable for initial layout. It’s not offered for Mac OS and I’m not willing to dual boot. Again, not a deal-breaker because I use a Dell desktop for most worship layout and Pub stuff now anyway, so I just have to move to a different machine. Mac OS tends to leave things running in the background more. If I’m not quick to “Quit” them, my system can get bogged down and hang up. I’ve then got to cycle through my open windows and close what I don’t need. My Faith Inkubator PowerPoint slides don’t quite run right but I haven’t spent much time researching a work-around. I have to use my laptop for projection anyway. My view is somewhat obstructed from this Thunderbolt display but I’m willing to make the sacrifice. My power supply is in the way and I’ve got a USB cord over 10 ft. long connecting to my laser printer. I’ve just got to be careful how I walk around. But I’m not quite done yet. I’ve got some other things I’d still like to do to my Mac Mini rig. I call them: THE DREAMY. 2. Brother HL-2270DW: The over-extended USB cord to the printer is my biggest tripping hazard. I poked around for a wireless add-on to my existing printer but a whole new printer may be the solution. 3. RAM Upgrade: As I mentioned above, my current Mac Mini can hang if I leave too many windows open at once. It’s only got 4 GB of RAM. It’s about $100 to double it. I hope this would help with some of the hanging issues I’ve experienced. 4. Mounted Flat-screen monitor and Apple TV: My office is right next to a small conference room where I teach a weekly Bible study and Confirmation. I would love to mount some sort of flatscreen to the wall and attach an Apple TV. I wouldn’t have to set up an LCD projector and laptop every week for Confirmation class. I could just take my wireless keyboard into the next room, load up my presentation, and share it to Apple TV. Easy peasey lemon squeezy. Not to mention that I could also stream some videos through iTunes. So there you have it. 31 Days into the great Mac experiment and so far I’m digging it. There are some limitations but nothing that costs me a huge amount of time or brain energy. If you have any suggestions for some of the issues that I’ve listed above, I would love to hear them. I am in no way a Mac expert; I’m very much a neophyte so I would welcome any and all helps!